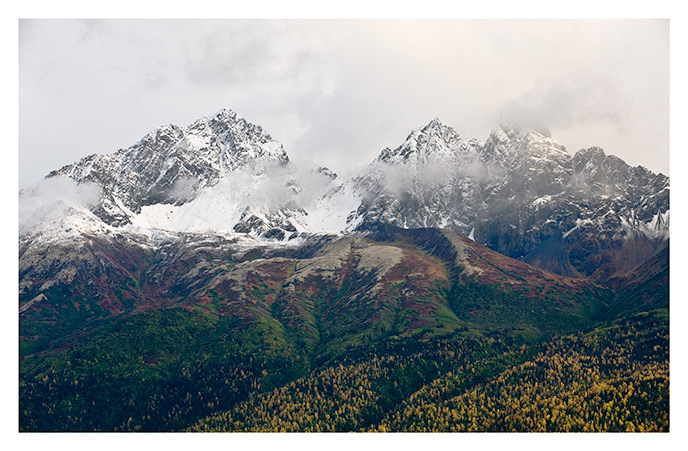 In September 2008 I took a trip to Alaska to photograph and see what I could of the state in a week. And of course I learned that you can't see much in a week! In June 2018 I returned for another week covered some of the same ground. 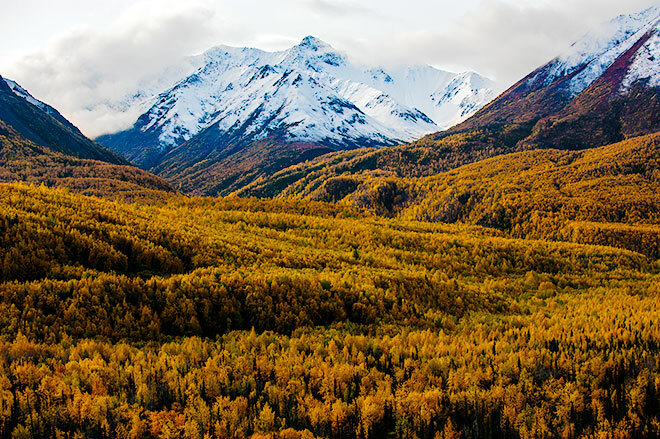 I stayed in Anchorage and travelled where I could in three directions: north, east, and south. North, I drove up to Denali National Park and took the shuttle to Wonder Lake. 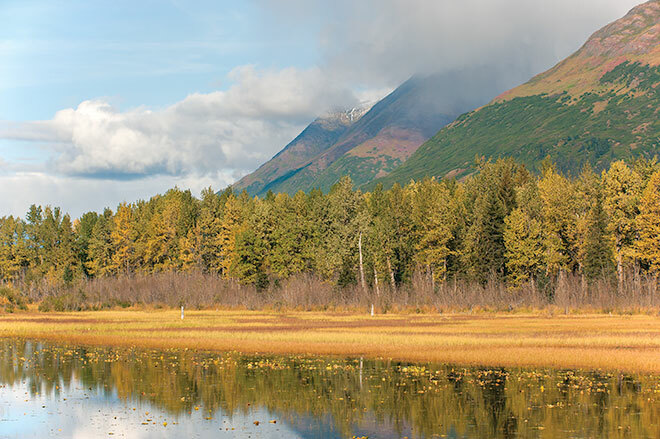 East, I took a drive along the Glenn Highway through the Matanuska Valley and along the northern edge of the Chugach Mountains to Copper Center. And south, I drove along Turnagain Arm to Girdwood and Whittier, then further south through the Kenai Peninsula to Seward and Kenai. From Whittier I took a Phillips glacier tour of some of the tidewater glaciers on Prince William Sound. 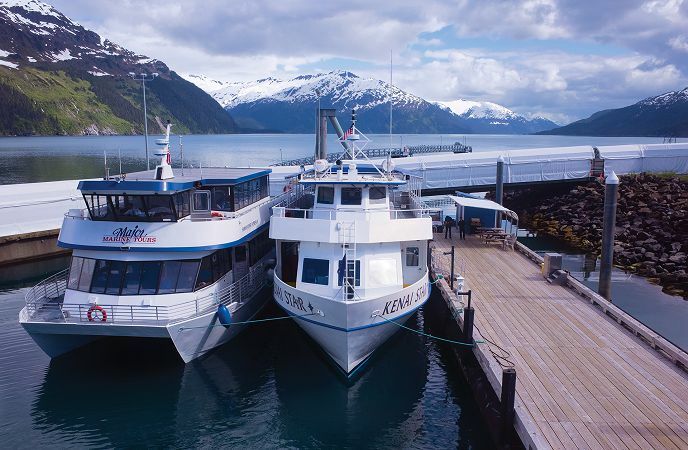 The big boat harbor in Whittier, Alaska, jumping off place for water cruises of Prince William Sound. Prints available in the following sizes. 8 x 10 inches 11 x 14 inches 16 x 20 inches 14 x 21 inches Please query for stock use. Brief glimpse of Denali from the north viewpoint on Alaska Highway 3. 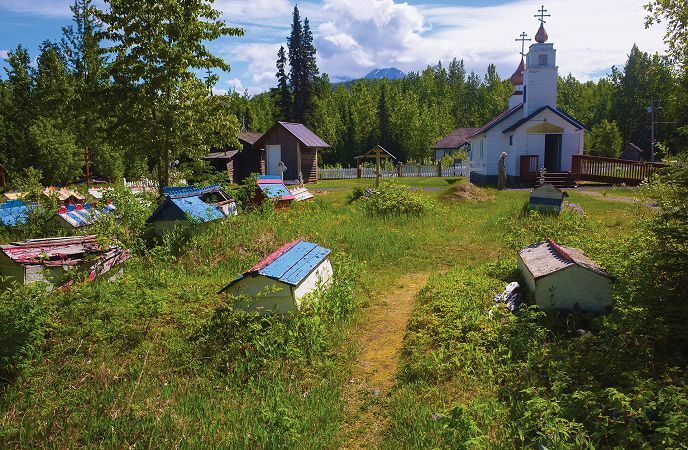 Athabascan spirit houses sitting atop graves in the Orthodox cemetery in Eklutna, Alaska. 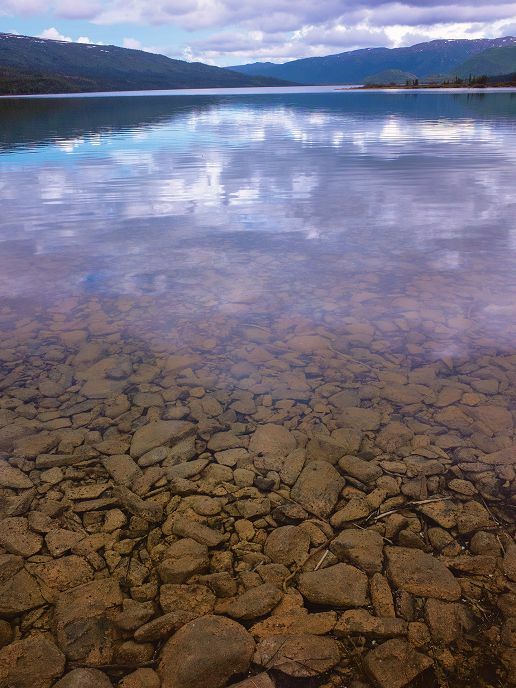 Alas, no view of Denali from Wonder Lake this day but the lake itself is still a beautiful sight. 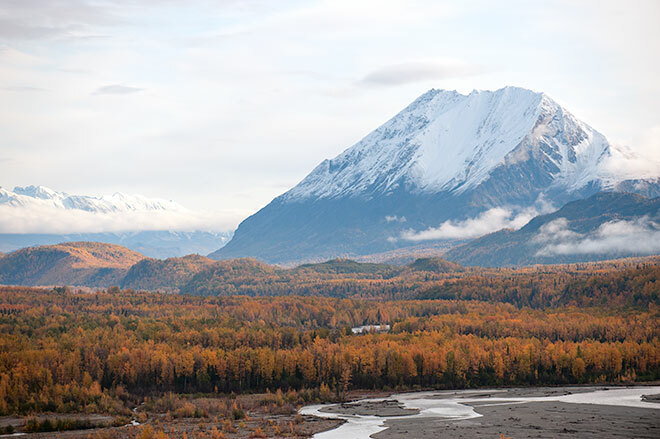 This view from upper Matanuska Valley about 12 miles east of Palmer. The day before the view was equally magnificent but without the mountain: dark, swirling clouds filled the valley. I much prefer the mountain however. 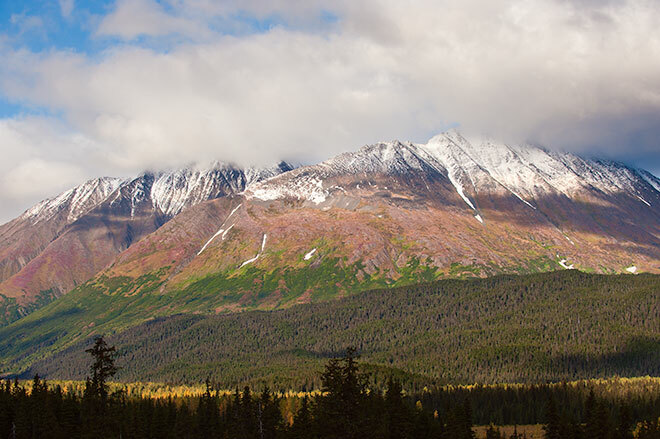 View of King Mountain from the Glenn Highway near Chickaloon. Actually this is a nameless little pond outside Willow, Alaska that I'd stopped to admire on the way back from Denali State Park. The clouds were breaking up after a gray, rainy day and two swans flew in to complete the picture. 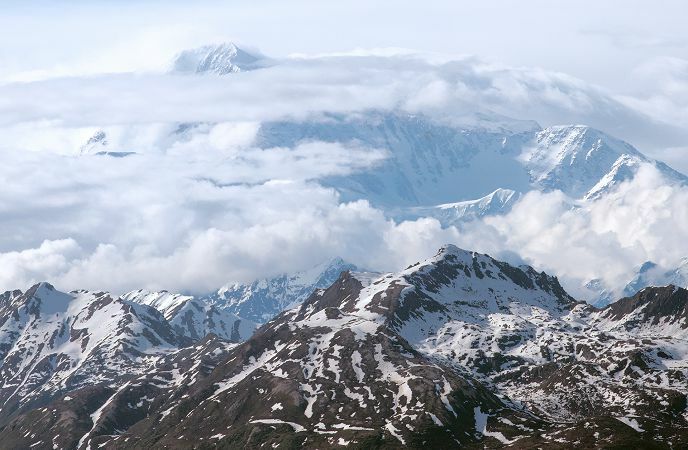 View across the Campbell Creek valley to Little O'Malley Peak (center right) and O'Malley Peak (right) from the top of Flattop Mountain. 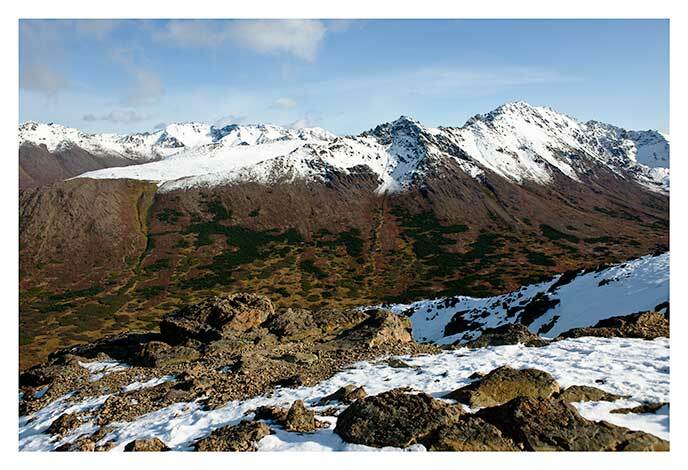 Flattop Mountain is outside Anchorage and is a short hike from the Glen Alps trailhead. 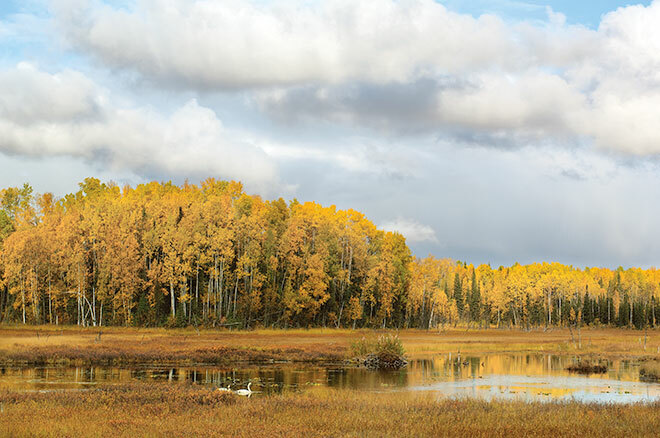 Acres of birches in fall colors, all the way up to the snow line. 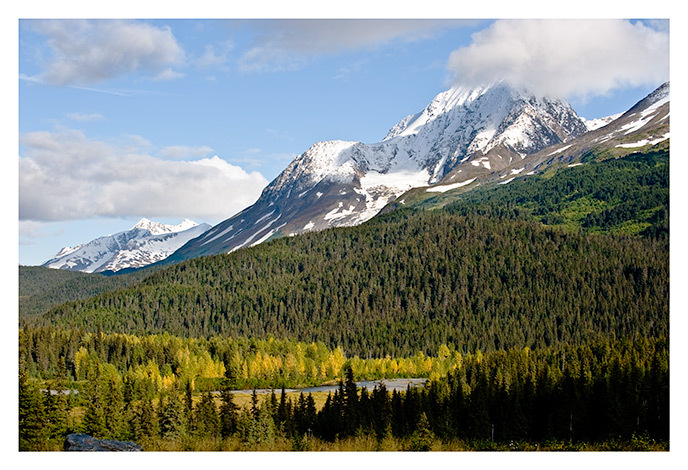 This shot was from Alaska Highway 1 (the Glenn Highway) a couples of miles east of King Mountain. 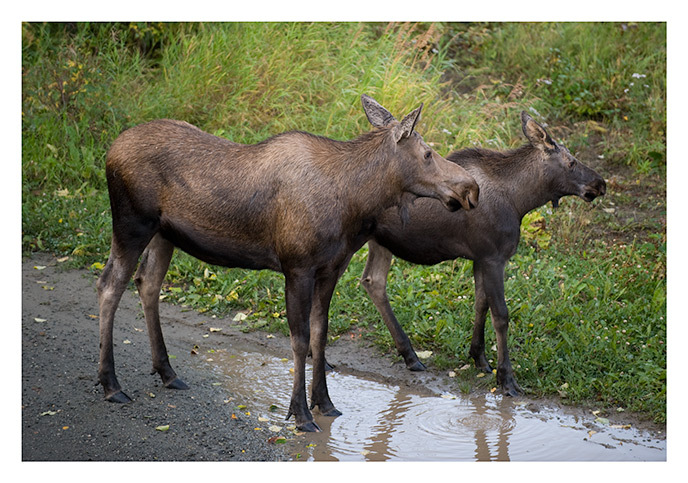 These moose wandered up behind me while I was taking pictures in Anchorage's Kincade Park. 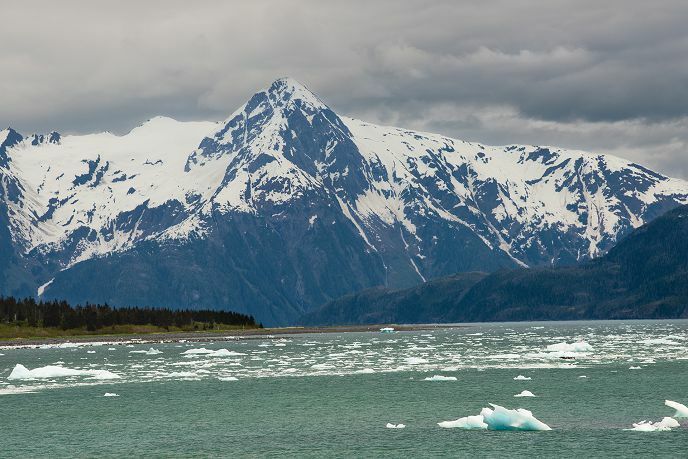 I stood on a little knoll and my attention was on the mountains across Cook Inlet; I didn't even hear them until they were about fifteen feet away and began slurping water from a mud puddle. It was the first time I'd seen a moose in the flesh; this duo did not seem too offended when I began snapping away, but they soon saw something more interesting off in the bushes and ambled off. 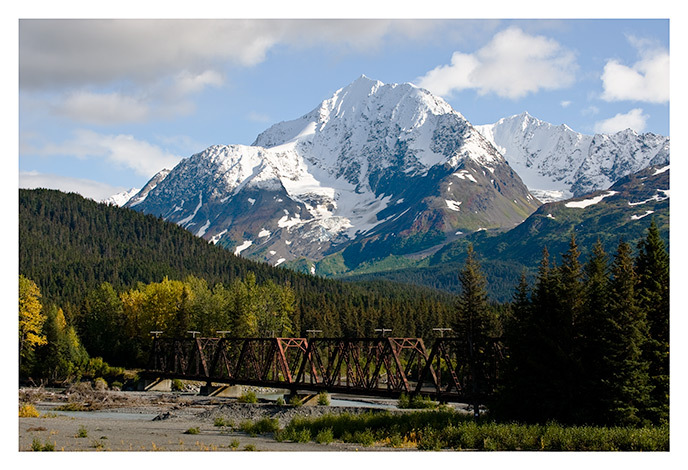 View of Paradise Peak and the Alaska Railroad from the Seward Highway south of Lakeview. Several miles northeast of this spot the railroad passes the fabled Snoring Inn (now merely a name on a topo map, alas). But who can tell us about the Snoring Inn? I'll admit I've come up empty handed so far. 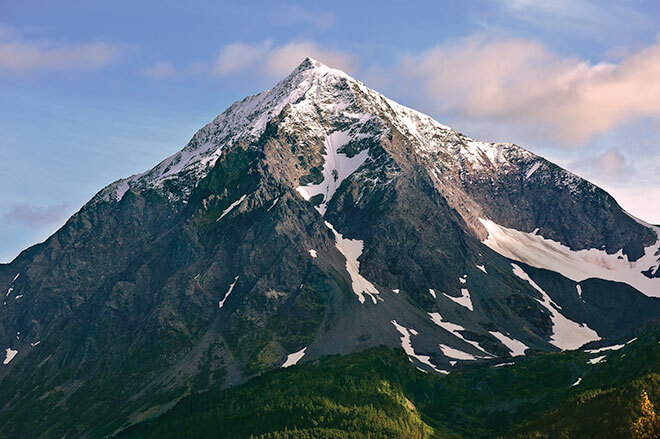 I had previously labeled this peak "Andy Simons Mountain" in previous versions of the website. Thanks to Sam Satathite for pointing out that I had the wrong peak. 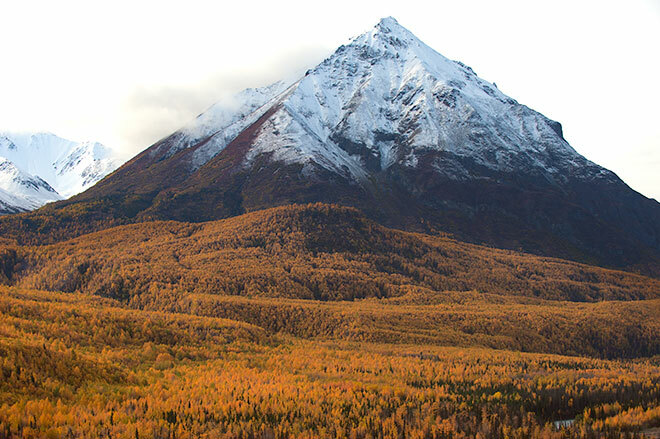 A sunny view of Paradise Peak from the Seward highway near Lakeview. Trail lake, looking north at the mountains above Falls Creek on the Kenai Peninsula. 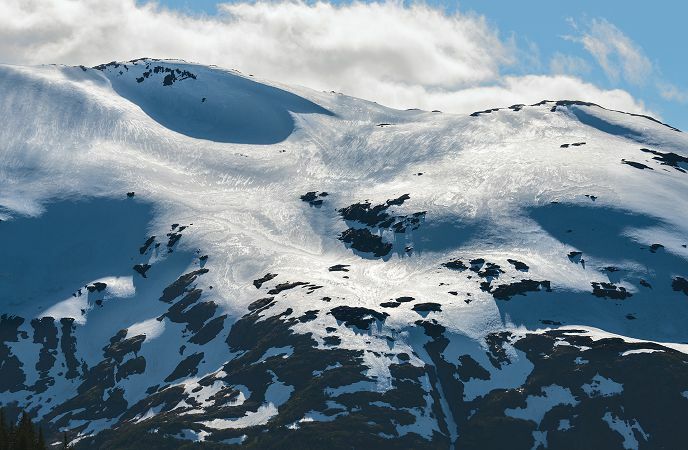 Peaks above the Snow River, Kenai Range, from the Seward Highway south of Lakeview. Mt. Benson (4,274 feet), catching the last of the light. 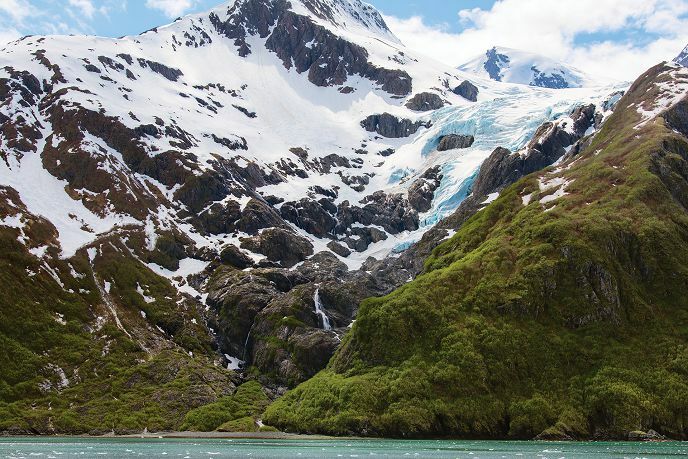 This was taken from near the mouth of the Exit Glacier, a few miles west of Seward on the Kenai Peninsula. 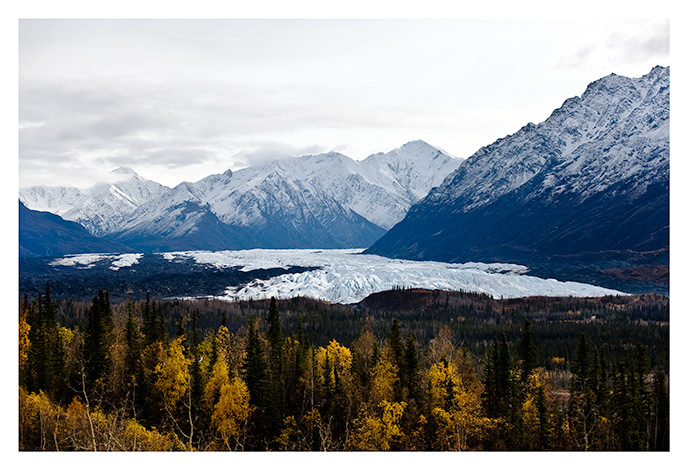 Matanuska Glacier from the Glenn Highway near Meekins Roadhouse. The east shoulder of Mt. Wickersham rises at the right of the photo. Goat Mountain (left) and Twin Peaks (right) from the Knik River Bridge on Highway 1. The somber light didn't entirely suppress a few subtle colors peeking forth. Pioneer Peak from south Palmer. 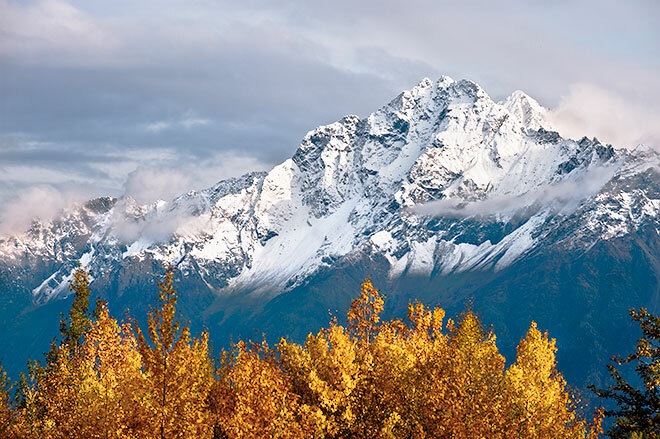 If this isn't the Matanuska Valley icon it should be; it is an ever-present sight from the valley so long as the clouds don't cover it.